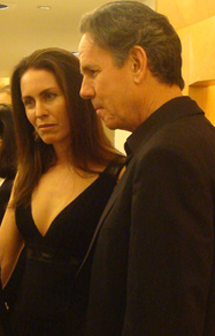 Yes, a knowledgeable source has confirmed that four-star Chef Thomas Keller of the French Laundry in Yountville is indeed engaged to long-time girlfriend, Laura Cunningham. Cunningham is the former general manager of the French Laundry and former director of operations for all of Keller’s restaurants. It was she who was largely responsible for shaping the flawless, unobtrusive, elegant service the French Laundry is known for. She left the fold in 2006 to start her own consulting business. Around the same time, she and Keller also split, after having been together as a couple for a decade. They met when Keller bought the French Laundry building in 1994. Cunningham, who grew up in St. Helena and had worked for Chef Jeremiah Tower, came knocking with her resume. Keller said there were no jobs, but took the resume anyway, before he quickly shut the door. A few days later, he came to his senses and called her back to give her a job. No word yet on whether the nuptials will be this year or next. It already will be quite the busy year for the duo. Cunningham is opening her own restaurant in Yountville, across the way from the French Laundry. The Sicilian and Southern Italian restaurant will be named Vita, after her grandmother. It is expected to open this fall. Also this fall, Keller will open another branch of Bouchon Bistro and Bouchon Bakery in Beverly Hills, next to the Montage Hotel. With all that already on their plates, would a 2009 wedding be too much to handle? Stay tuned….After all, if anyone can pull off the perfect wedding under any circumstances, it’s these two. Wow! Congrats to them! (And yes, I’ll say it: FINALLY!). I’m really glad it worked out for these two! Do you suppose they will hire someone to do the food at the wedding? Wow, talk about PRESSURE! awwwww, I love love! congrats to them!! Do we think Thomas will oversee the food, himself? Chefs have been known to do crazy things like that on their wedding day. wow, i didn’t even know he had an SO. LOL, Food Gal you’re like the Entertainment Tonight for the food world! 😉 I’m such a cynic, I think he’s marrying her so that he can get her new restaurant into his fold or at least get 50 percent of the earnings. Plus, ya think Thomas is really hurting for new restaurants or more earnings? Him? Of all people? I think it’s a case of two people who compliment and complete one another, and who finally realized that they do. Thank you for sharing this – I always enjoy reading the news about the 5-star chefs. He’s going to be UNDER PRESSURE 🙂 more seriously, I’m a big fan of Thomas Keller. Congrats to the couple! and I’m on the French Laundry’s waiting list for three nights (21st, 22nd, 23rd). If I will make it to the restaurant, I will tell you the wishes in person…. Carlotta: I hope you get to dine at the French Laundry while you’re here. It truly is a most memorable experience. And I have had friends who managed to snag a table on the wait list. So it definitely could happen for you. Enjoy!